The Cable Arch speaker cable elevators by RhythmiCraft help lower noise, increase dynamics and eliminate static charge by elevating your power and signal cables off the floor. There are other cable elevators or "isolators" on the market that perform their intended purpose, but our Cable Arch does all of that and goes one step further... it looks great! 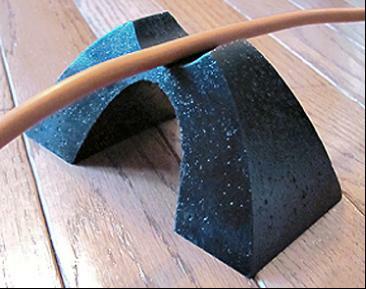 Made of a dense and heavy black urethane resin, our cable lift has a tumbled stone texture that is a work of art and will complement the decor of any hifi audio/video system. The weight and wide stance of the Cable Arch creates a very stable, tip resistant platform for your high end signal cables. and a little tightening of the lower end of the sound. Things look much better with the arches under the cables!"